Concierge Angel is a free to use, unique, interactive wedding and events planning directory. It enables you to search for local and global suppliers. There are helpful client reviews and upcoming events too. Concierge Angel brings you one click closer to your next celebration. My paid listing period has finished what do I do next? You can renew your listing or alternatively downgrade to a free listing. How long will it take to be listed after submission? Your listing will be reviewed by our design team promptly and will usually be live within 7 working days. I don't see a suitable category to list in? If your business is related to wedding or events please contact us and we can create a suitable category. Can my clients leave reviews? Yes they can just go to the bottom of your listing to leave a review. 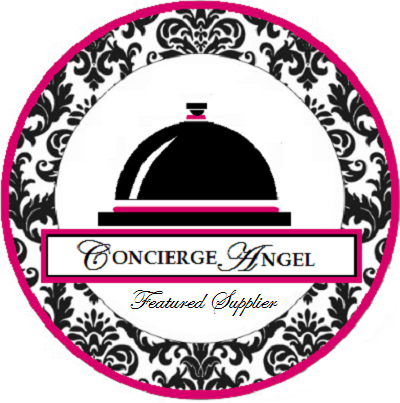 Do you have a badge I can display to share that our business is listing on Concierge Angel? As a registered user we would be delighted for you to use our badge on your website and across social media to show that you are a supplier listed on ConciergeAngel.com. Right click and save the image. Yes you can submit an updated listing or edit your listing by logging into your easy admin account. I registered but I am not listed? Please click on update listing or by logging into your Easy Admin Account. Check how to get listed in the quick listing guide. Please Register and create your listing. Please refer to the Quick listing guide. Why are there are only a few listings in some countries? As a new directory we have new listings appearing daily. Over time you will find more listings throughout the world so do check back. What regions does Concierge Angel cover? We have supplier listings covering the whole world. How many visitors does Concierge Angel get? On average we are receiving 10,000 page views a month and this is increasing every month. Concierge Angel has over 37,000 followers across Twitter, Facebook and Instagram and reaches approximately 300,000 a month on social media as well.